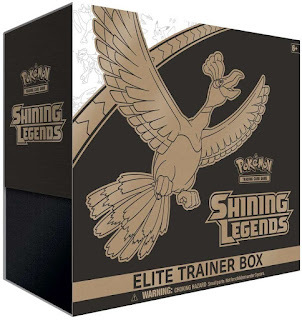 Head over to get this Pokemon Shining Legends Elite Trainer Box for ONLY $38.63 (Retail $74.99)! Blaze a Bright Trail with Shining Pokémon. In each region, a handful of Pokémon stand apart as creatures of heroic stories and wild adventures: Zekrom, Latios, Mewtwo-GX, Entei-GX. Others are just whispers and rumors: mysterious Pokémon such as Keldeo, Shining Jirachi, Shining Volcanion--and many more. See and collect these astounding Pokémon of myth and legend, and join the Elite Trainers with the Pokémon TCG: Shining Legends Elite Trainer Box.